Thembi Kgatlana was named African Women's Player of the Year at the 2018 Caf awards. African Women's Player of the Year Thembi Kgatlana and her South African compatriot Linda Motlhalo have both joined Chinese club Beijing BG Phoenix FC. Forward Kgatlana, 22, and midfielder Motlhalo, 20, released by United States' National Women's Soccer League side Houston Dash early this month, join on one-year deals each with option for an additional year. Kgatlana, who scored two goals during her year in Houston, says she is ready for a new adventure. "I would like to thank Beijing BG Phoenix for taking me and giving me a home full of opportunities," Kgatlana wrote on social media. "I am looking forward to the adventure. Thank you Houston Dash for everything." The Banyana Banyana duo helped South Africa finish runners-up at the 2018 African Women's Cup of Nations. 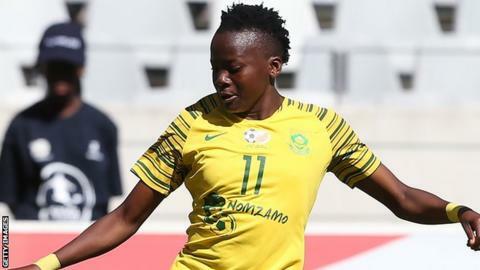 Kgatlana was named African Women's Player of the Year and also won the Goal of the Year at the 2018 Caf awards last month.